This doll was made in Russia in 1993 following the collapse of the Soviet Union. It is a political statement in criticism of the KGB and Communism. Each doll is a KGB thug in uniform and lists various Communist atrocities on the back: Communist countries, Genocide with years, Communist leaders, Atrocities (murder, kidnaps, arrests…), and Prisons. 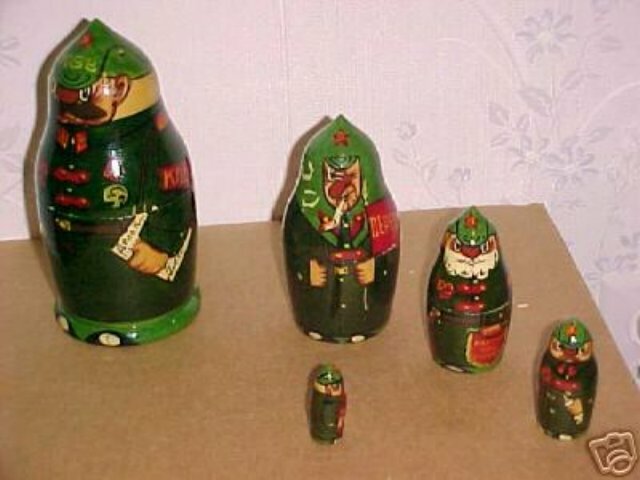 The dolls are painted with shoes on the bottom, and the outer doll is signed by the Russian artist.